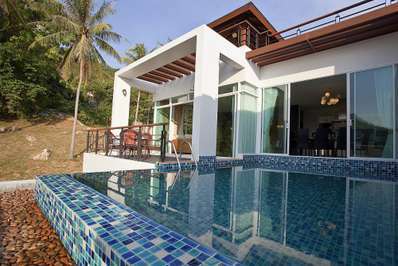 Makata Villa are located near Kata Noi beach at Katamanda Private estate. Only 350 metre distance walking within private walkway of the estate to the beach. Adjacent to Villa Makata 2, is the Clubhouse. This is a wonderful place to meet fellow guest, staying within the Estate. Terrace Café offers delicious food and drinks, a place to catch up and make new friends. Included in the Clubhouse is a floodlit tennis court, a well equipped gym, and a enormous palm fringed swimming pool. Changing and showrooms are also on site. Gratuities for household staff are encouraged and normal, but are left entirely to the Guest’s discretion. US $50.00 per single mattress per day. The Villa has Infinity edged 8 x 4 metre swimming pool with 4 sundecks and outdoor Sala with outdoor 6 seaters L shape Sofa make the outdoor living space ideal for relaxing while soaking up the sun, or dining with an amazing meal prepared by your personal Chef. The pool deck can be able to converted to outdoor dining space with full table set up for up to 14 people where you will end a perfect evening during your holiday. Entering Villa Makata I gives the feeling of tranquility, calm and privacy. You will be surprised at the large open plan layout with the beautiful vaulted ceilings, air con along with the tri-fold Patio doors and insect screens, which gives the whole area a lovely bright and airy feel. The villa has been furnished to very high standards. The fully fitted western kitchen is fitted with top of the range Siemens appliances, including oven, microwave, dishwasher and a large fridge freezer. Extra appliances include juicer, Nespresso coffee maker, in fact everything you could possibly need. The master bedroom has beautiful vaulted ceilings, polished timber floors. A romantic draped four poster bed and air con. Plenty of wardrobe space, a seating area and TV. En-suite consist of two large vanity units and basins, a separate shower and toilet cubical. Access to a welcoming private courtyard with your very own sunken Balinese style bath. All bathrooms are equipped with amenities, hairdryer and bathrobes. Butler services are available at the villa between 7am - 10pm. Staffs provide daily cleaning service, and turn down service. Linenswill be changed every 3 nights stay. Bath towels and Pool towels are provided and dialy replaced. Additional services such as those of babysitters and/or drivers can be sourced in advance or on site upon request. Any excusions during your stay can be provided and recommended by Villa Manager. 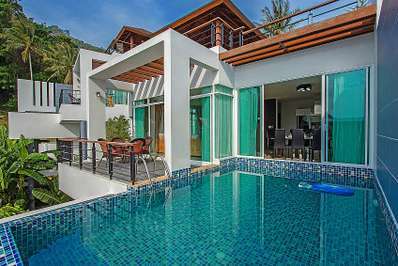 Located in Kata beach, Phuket. Kata Horizon Villa B1 is a in Thailand. 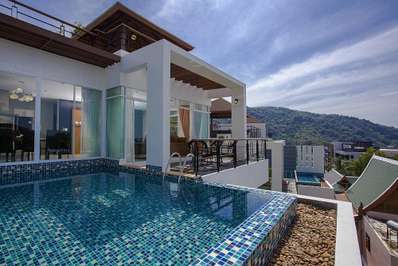 Located in Kata beach, Phuket. Kata Horizon Villa A2 is a in Thailand. Located in Kata beach, Phuket. Kata Horizon Villa B2 is a in Thailand.